Ukraine is full of Museums or Open Museums so to say. They are all attractive. They attract visitors. They all represent architectural nuances. They are all worth seeing. In this article we will see one Open theater museum in Kiev, Ukraine. This is Pyrohiv Museum of Folk Architecture. The name itself suggests that it represents the architecture and folk art. 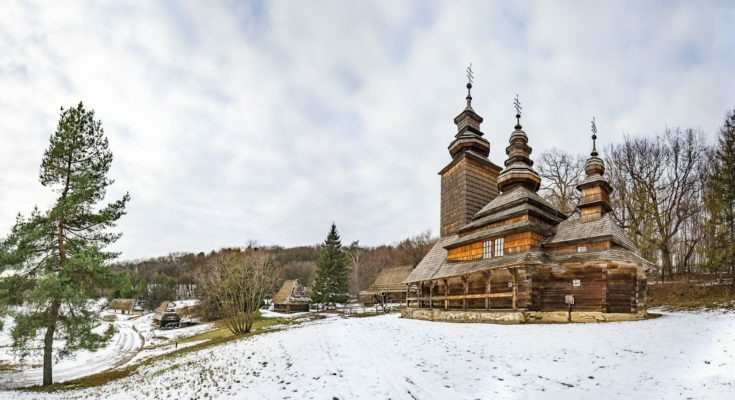 This Open Air Museum of Ukraine stretches on the vast area of over 150 hectares and symbolizes folk architecture, rural life and folk art. One specialty of this museum is that one can see a collection of folk architecture from all regions of Ukraine gathered in this museum. As a visitor when you are on Ukraine trip or Kiev trip, then you should be here to admire rare exhibits and also the folk crafts shop along with a traditional restaurant offering Ukrainian cuisine. So there is quite a lot for visitors at Pyrohiv Museum of Folk architecture. Let us explore about it in next few paragraphs. Pyrohiv Museum was founded in late 1960 but opened to public only after a decade. So the museum saw its first visitor in 1976. So this museum is located only 12 KM to the southwest of Kiev in the beautiful setting of Pyrohovo village. So what makes this museum stand out? Well there are two things special about Pyrohiv museum. 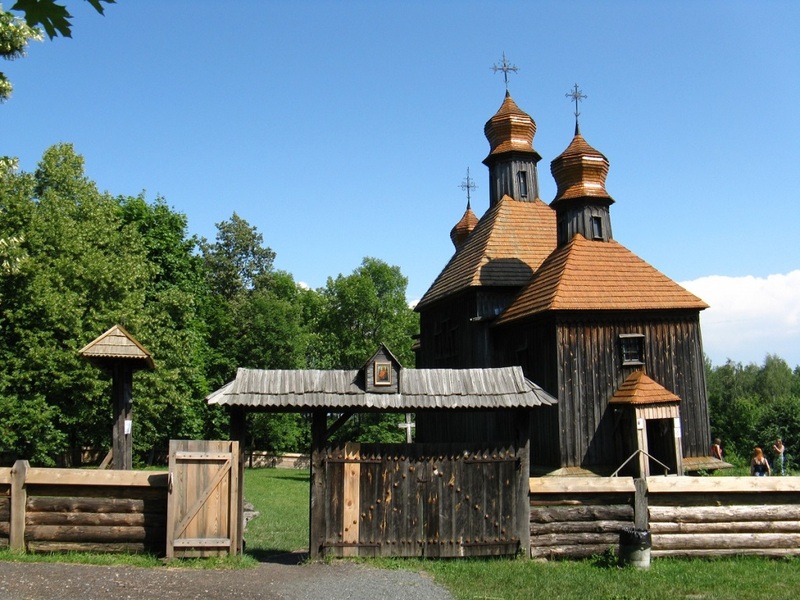 One, the quaint 17th-20th century wooden churches, cottages, farmsteads and windmills which are divided into seven villages and each one of them represent regional areas of Ukraine which means over an afternoon you can walk through the architectures of eastern to western to southern Ukraine. Two, workers here play out different village roles during the summer season. From carving wood, making pottery, doing embroidery to driving carts and horses they play all roles. So you can see their work especially in summers. The place is cool as it has got restaurants, pubs and stalls selling food and even kid find it perfect place to be at. Today after decades since its existence the Pyrohiv Museum of Folk Architecture has huge collection of over 200 structures, some of which were brought from different parts of Ukraine. You can see some exhibits here which are replica of typical old traditional buildings. The museum also has rich collection of over 40, 000 ethnographic exhibits which consist of old timers folk costumes, fabrics, embroidery, carpets, articles of metals, ceramics, glassware, wood, musical instruments, paintings and household items. The best part about these exhibits is that visitors can visualise them, see and feel how people a century ago lived. The exhibition of the museum is divided into two departments. First shows Architecture and life in the Ukrainian village before the revolution and second department shows Folk architecture and life in the socialist village. You can see these in detail and go through the historical elements of these exhibitions to get real historic feel of them. Another interesting facts for visitors is that Pyrohiv hosts several festivals every year and biggest of them is during the countrywide Ivan Kupala festival. You can enjoy Ukrainian musicians playing on weekends in the museum. So how to reach to to the Pyrohiv Museum of Folk Architetcure? Museum is near Pyrohovo village. You can take Marshrutka 172 from Vystavkovy Tsentr metro station and you will reach right by the entrance of the museum. You can also take taxi to get here. Here apart from scenic beauty you also get to see wooden churches. There is special crafts festival also during summer and fall. 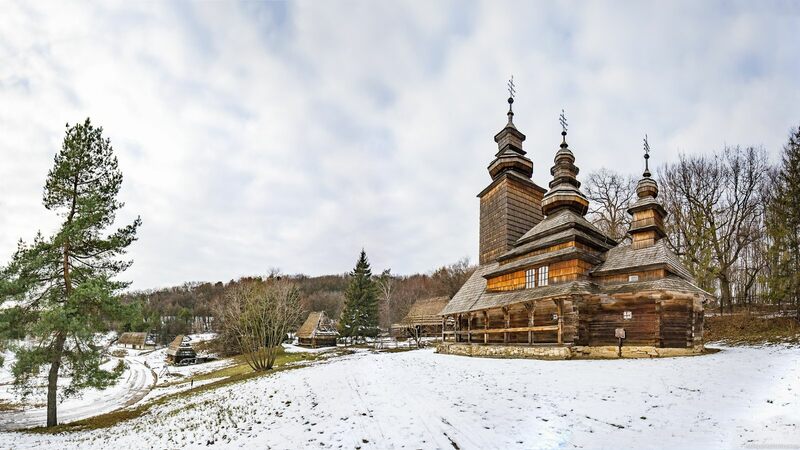 So as there is plenty for visitors it is apt to say that when you are on a Ukraine tour or if you have taken Ukraine Travel Package then do visit Pyrohovo Museum of Folk architecture which is just 12 KM from Kiev.